The Survival Ark Stone & Burr home flour mills are designed to give you the best in a hand mill, plus making them easily adaptable to a motor or other type of power. This form has been prepared to help you determine the best way to motorise your Survival Mill. IMPORTANT: When motorising your mill hand Stone and Burr flour mill, be sure that the milling stones turn at 150 R.P.M or less. The Stones are designed to turn slow, and if they are run at a speed of more than 150 R.P.M., they could be damaged. 1. ELECTRIC MOTOR: A motor of at least ¼ H.P. 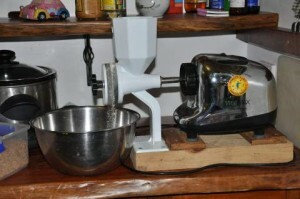 is needed to operate the manual mills satisfactorily 1/3 or ½ horsepower motors work well too. We recommend that a motor of 1440 R.P.M. or less be used. When using a 1440 R.P.M. motor you will need a 12” inch pulley on the mill drive shaft and a 1¼” pulley on the motor drive shaft. Here are the easy ABC motorisation instructions for the manual mills. 1. First it is important to source in good working order a 1/3 or 1/4 hp OLD washing machine motor. A suitable motor would be an old motor from an old hoover or simpson washing machine that may even be some 30 or 40 years old. (a) Old or new motor must already have a support bracket base as part and parcel of the motor itself. (b) The support bracket must have 4 SLOTS in the base, not HOLES. The reason for this is that with holes you do not have any adjustment for the tension adjustment on the fan belt. (c) Drive shaft on the motor needs to be 1/2″ as the small pulleys hole is 1/2″ If you source a motor with a 5/8″ drive shaft it is possible to drill or ream it out but what a waste of time unless you are an engineer with a drill or lathe. (d) Almost all 1/4 hp and 1/3 hp motors have 1/3″ drive shafts. Larger motors like 1/2 hp 3/4 hp and 1 hp have larger drive shaft like 5/8″ and 5/8″ is OK to use. We normally have a small supply of 5/8″ small pulleys which we do a change over on if a customer has a larger drive shaft. Customers can put the 1/2″ small pulley in a jiffy bag and put their address on one side and our address on the other side. On receipt we will know you need a pulley with a larger drive shaft hole and we will replace your pulley and send you a new one with correct hole. (e) Do not purchase a motor with an external fan that has to be removed as it will be useless. 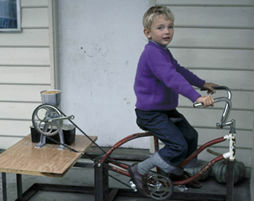 Buy an old motor like in the photo of the motorised Little Ark. To utilise a motor at higher R.P.M than 1440, you will need to use a multiple pulley set up to reduce speed. So that the stones do not turn too fast as mentioned above. Second-hand old washing machine motors from early Hoover or Simpson wringer type washing machines are often available from older folk, who could just not throw them away and are usually economical to purchase, as old motors have no real commercial value. 2 . The stone mills can be operated by using a heavy duty electric drill half inch or larger. In some cases the chuck on the drill can be attached directly to the handle shaft on the mills. 3. There are many different ways the Stone and Burr hand mills can be converted to other power sources. Below are just some ideas, but you may have a better idea than any of these. If you would care to share your ideas with us, we would appreciate hearing from you. The ideas listed below are only some possible suggestions, and are in no way complete. A. A D.C motor operated by a storage battery…the battery can be kept charged by a generator mounted to a windmill, or water wheel. B. If a creek, canal, or other waterpower sources are available, a small water wheel can be built and connected to the mills. A very small amount of moving water will run the mills. C. A small gasoline engine could be used to run the mill much like an electric motor, or run a generator or battery power as mentioned in item “A” above. D. A small tread mill, or movable platform can be made (a tread mill is much like a miniature escalator and as you walk up on it, the platform moves down, thereby utilising ones weight to operate it). A large pet could be used to run the treadmill, which in turn would run the flour mills. E. Electrical appliances and machines such as mixers, meat grinders, bread makers, and many other home and shop equipment may be utilised to fit your motorisation needs.